I know when I think of Hydrogen Peroxide the first use that comes to my mind is for wound care and using it to clean out any bacterial infections when you are dressing cuts and scrapes. One thing you may not know is that hydrogen peroxide is composed of only water and oxygen so it can be great for loads of other uses. Sinus Infections: Use a tablespoon of 3% Hydrogen Peroxide to 1 cup of non-chlorinated water. This solution can be used as a homemade nasal spray. Bleach Alternative: Add a cup of hydrogen peroxide to your whites as a bleach alternative. Hydrogen peroxide is also great for getting out blood stains on clothes and other fabrics like carpet. Be careful with using it to remove stains on fabrics and carpets as it is a bleach. Mouthwash: Hydrogen peroxide has healing properties so it works great as a mouthwash for canker sores and toothaches. Swish your mouth with one capful (up to 10 minutes) and spit out. Do not swallow the peroxide!! Homemade Toothpaste: Mix 3% hydrogen peroxide with baking soda to make a paste. Hydrogen peroxide is great for whitening. Mold: Hydrogen peroxide is great for cleaning any mold problems. Fruit/Vegetable Wash: Soak or wash your vegetables to kill bacteria and neutralize chemicals. 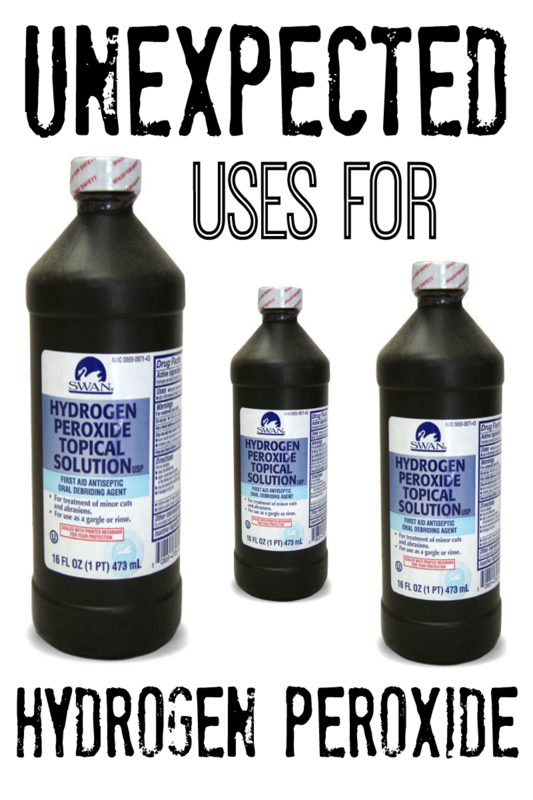 What do you most use hydrogen peroxide for? Want to learn more unexpected uses for honey, chalk, Epsom salt, etc? Ways to spruce up your home office! Oh going to pin this! I did not know most of those.